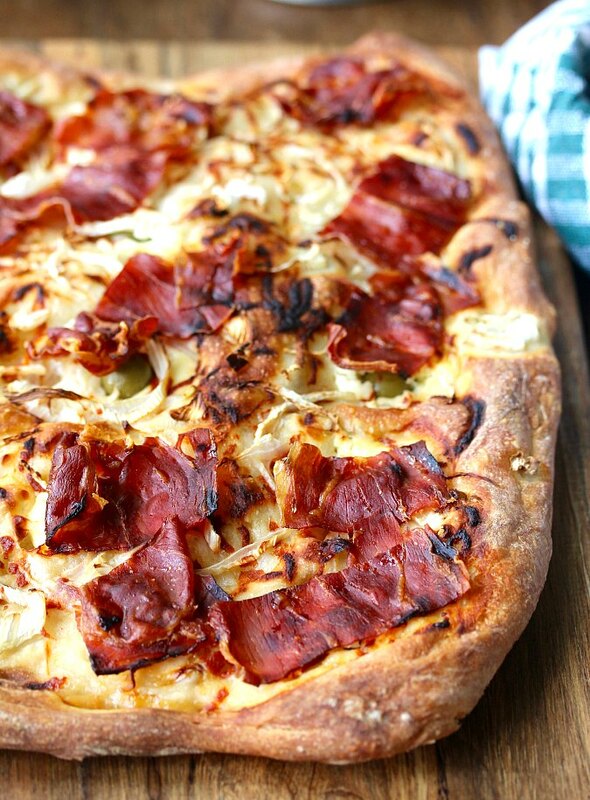 This Prosciutto and Fennel Pizza with Olives and Mascarpone is such an interesting combination of flavors. 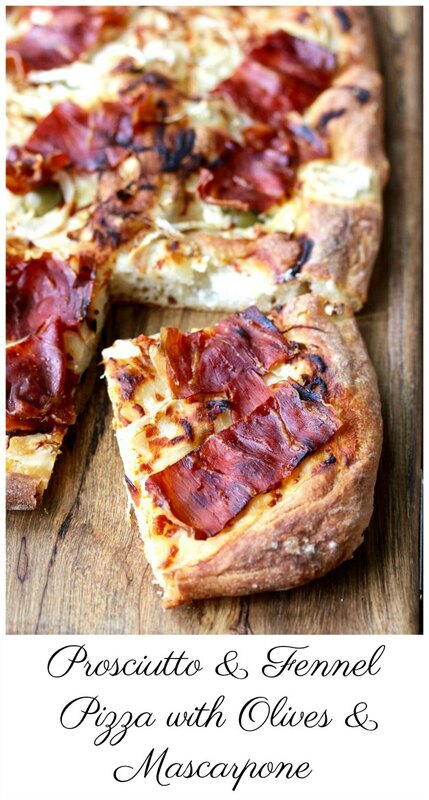 It's topped with slices of prosciutto placed over mascarpone, fennel, olives, as well as Sriracha sauce. It's a pretty amazing combination of flavors. I figured this Prosciutto and Fennel Pizza with Olives and Mascarpone would only appeal to grown ups, but surprisingly, my darling grandsons fell in love with it too. The recipe for the pizza dough makes two pizzas, so you can use the other half for any pizza of your choice. You can also freeze the other half of the dough for later. 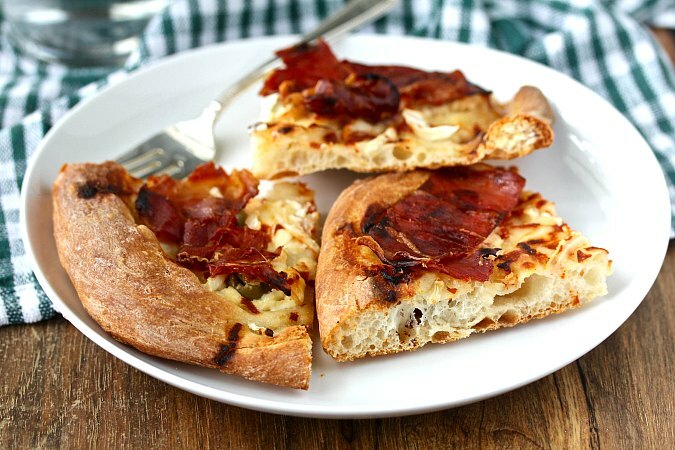 I'm completely in love with the airy and crispy crust in this pizza. To me, that is a sign of a great pie. The crust is easy to pull together and is stretched out onto an 18 inch by 13 inch baking sheet. The flavors of these ingredients are pretty spectacular, and the ingredients are fairly easy to find. I fell in love with the flavors of this pizza. I also love the airiness of the crust. While I used Prosciutto for the meat in this pizza, if you can find Capicola, use it. It's a cured pork that is similar to Prosciutto, but it is round, perfect for the spirit of this pie. October is National Pizza Month, and Colleen of the Redhead Baker has pulled us together so we can all post pizza recipes. I'm very excited about the recipes that everyone has contributed! This recipe was adapted from The Sullivan Street Bakery Cookbook. I have all three of his books and love them all. 500 grams (3 1/3 cups) unbleached all-purpose flour, plus flour for shaping if necessary. Mix the flour, sugar, salt, and yeast in the mixer on low. Add the water and mix on low for 30 seconds. Raise the speed to high speed and mix for about 3 to 4 minutes, until the dough is cohesive. Cover and let rise until it doubles, about 2 hours. Divide the dough in half and wrap one half in plastic and refrigerate or freeze. Lightly flour a parchment lined half sheet pan. Dust one half of the dough with flour and place it on the parchment paper. Form the dough into a ball. Let the dough rise until bubbly and doubled again, about 1 to 3 hours. Gently pull the dough outward and upward to fit the half sheet pan. Use your oiled fingers to dock the dough and encourage it to move outward and cover the half sheet pan. Place a pizza stone in the middle of your oven and heat to 450 degrees F.
Toss the fennel with the olive oil and black pepper. Arrange 15 dollops of the mascarpone onto the dough in three rows of 5. Put an olive on top of each dollop. 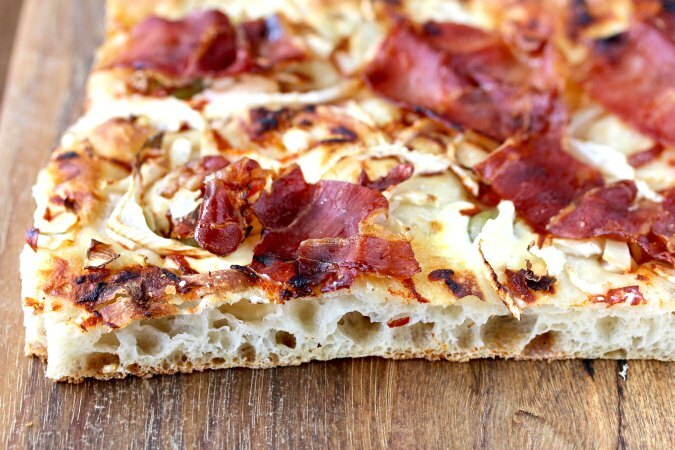 Drizzle the sriracha across the pizza and toss the fennel all over the pizza. Finally, top each olive with a slice of prosciutto or Capicola. Cover with oiled plastic wrap and let proof for 20 minutes. Place the sheet pan directly on the baking stone and bake for 20 to 25 minutes, until the ham is fully cooked and the dough is crispy and brown. Cut and serve immediately. One pizza for you, one pizza for Frank!